Where does innovation actually live? Is it held by a few ‘keepers of the flame’, a secretive cabal of ‘creatives’ within an organisation? Or perhaps it lives in a ‘Centre’, a special place where only a few of the chosen ones can concoct unique ideas from dark magick? For too long innovation has been seen as something ‘other people do’ in organisations. And innovation itself widely perceived as a unique world-beating idea coming into being from a eureka like moment. As a designer of over 25 years I’ve certainly benefitted from the perception of the ‘creative otherness’. I’ve been as everything from some kind of exotic pet…’look we have a creative person!’ to a kind of decorator adding ’the sparkle’. What to do? Enter Design Thinking, the solution-based methodology first brought to prominence in the 90s by IDEO. It’s time to get serious about design in all areas of business. Design Thinking is ‘human centred’ with a focus on the needs of people at its heart. 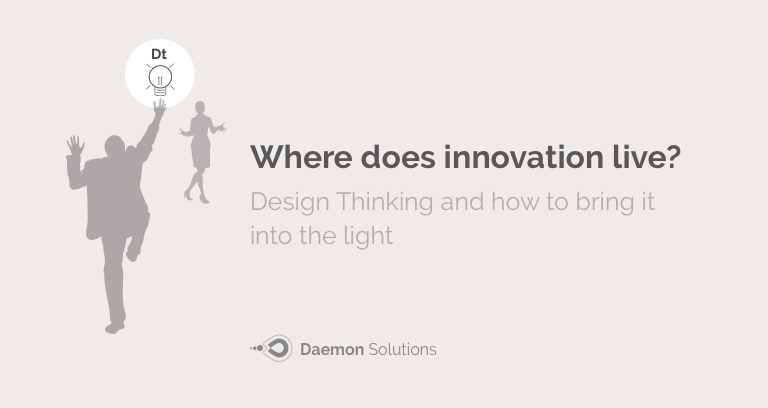 At Daemon this means encouraging people to spend time exploring a problem and prototyping quickly without the constraint of aiming for perfection, and embracing the possibility of ‘failure’ as an opportunity to learn and move on. When we say prototype we mean a fast way of getting your early ideas moved from concept to reality: a sketch, a few illustrative slides, a faster way of capturing data with a simple form or a basic chart made in Excel to visualise data and share some insight. It also means helping people who might routinely sit in a meeting taking notes on their computer to get up and articulate their thoughts on a whiteboard. It means showing not just telling, and it means giving people a few use case examples for them to understand context. All of these things can lead to a change in the way they approach problem solving. It’s true that creative inspiration can be something magic, and its source may not be fully understood or difficult to explain, but a guiding framework can mean the difference between time poorly spent in unstructured ’brainstorming’ sessions (‘…but we’ve got Sharpies and Post-Its!’) hoping for something to happen and a structured process that brings creativity to the fore and allows free thinking ideas to flow. A key aspect of Design Thinking is about helping everyone to think more like designers, who have honed their problem solving tools and techniques for many years. Giving people the keys to unlock innovation means showing them how, with practice, a guiding hand and a few tips on how to use those tools, they can start to think differently about the problems they face. Design Thinking, far from being the latest trend offers a growing toolkit to bring that process out of those dark and secretive chambers and into the light.